On Tuesday, the eighth-ranked Connecticut Huskies visited the Rock in Newark, N.J., to play the Seton Hall Pirates in a game that matched two of the best teams — according to their records — in the Big East. After 40 minutes of play, Seton Hall had beaten the favored Huskies, 75-63. With any upset, especially in college basketball, certain things happen that allow the underdog to win. There’s usually a gimmick, a shock, and a disappointment. You see them in every upset, and Seton Hall’s win over UConn was no exception. The gimmick is some extraordinary tactic used by the underdog to throw the other team off its game. 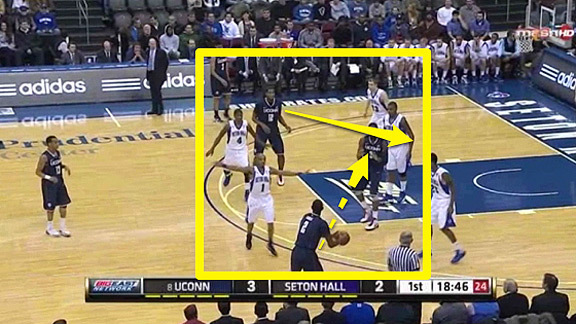 Seton Hall’s gimmick was zone defense. Now, the Pirates aren’t strangers to zone defense. Going into the UConn game, they had played zone about a third of the time this season. (Seton Hall had been averaging 22 possessions of zone out of 66 total possessions per game, according to their Pomroy page). Against UConn, the Pirates doubled up on their zone defense, playing it on 45 out of UConn’s 69 possessions, according to Synergy Sports. I don’t know if Seton Hall planned to play that much zone or if it was an in-game adjustment, but the defense held Connecticut to 34 points on those 45 possessions, good for a PPP of 0.755. On Seton Hall’s 24 man-to-man possessions, the Pirates gave up 29 points for a PPP 1.208. Why did the Huskies struggle against Seton Hall’s zone? First, UConn came out against the zone very weak and gave the Pirates confidence to stick with the defensive scheme. Second, Seton Hall’s zone forced the Huskies to start their offense farther from the basket than they’re used to doing. When a team comes out in a zone, the best way to take them out of it is to score a few baskets in a row. Three or four straight buckets against a team that doesn’t run zone full time will probably force them to doubt the defense. They’ll come out of the zone and go back to man. For this reason, UConn should have run its best zone offense early in the game to convince the Pirates that it wouldn’t work. Instead, UConn ran an unimaginative offense on the first few possessions, Seton Hall got a few stops, and, most important, the Pirates grew confident that they could shut the Huskies down with their zone. Upon seeing Seton Hall’s zone, the Huskies went into a high 1-4 set with two players on the wing and a big man at each elbow. UConn was looking to get the ball to one of the elbows and play high-low with the other big, who would dive to the rim. It’s a good quick-hitting play, but to break a zone a team needs to move the ball from side to side and make the defense rotate. When you enter the ball after one pass and the opposite big just dives, you aren’t getting that movement. The results are turnovers and misses. With no defensive three-second violation in college basketball, zone defenses are allowed to keep a defender right in the paint. UConn’s offense amounted to little more than sending a defender into the heart of the defense. On the first play, the defender was able to bother the pass. On the second play, the diving big man wasn’t open and the other big was forced to take a difficult shot. These two stops took place at the beginning of the game and gave Seton Hall confidence to stay in its zone. When UConn starts its offense so far from the basket, it’s easier for Seton Hall’s defense to react. On dribble penetration, UConn’s guards aren’t getting into the paint immediately and the defense has more time to rotate. This allows Seton Hall to cut off driving lanes and force passes to the outside. These long passes give the defense time to close out, and Seton Hall was able to close out and challenge UConn’s shot attempts Tuesday. The key to Cosby’s performance was the first open jumper he made. A freshman, Cosby was recruited as a knock-down shooter. Seventy-four of his 104 attempts were 3s going into the UConn game. However, Cosby hadn’t been shooting as well as expected so far this the season. When a player is struggling, especially at shooting, knocking down a wide-open 3 can be a huge confidence booster. After seeing that first shot tickle the net, Cosby hit three more 3s, including a few baskets that really broke the Huskies’ back. Napier didn’t do a good job of recognizing the zone defense, especially early in possessions. So when he tried to take his “man,” Napier was actually trying to dribble drive against the zone. As he penetrated into the defense, Napier repeatedly found himself surrounded by two or sometimes three Seton Hall defenders. In the two clips above, the defenders managed to knock the ball off of Napier and then out of bounds. Against the UConn Huskies, the Seton Hall Pirates to put together a textbook college hoops upset. They also grabbed a signature win that could help them reach the NCAA tournament on Selection Sunday. Cuban & Lamar or Tyson & Melo?